CAMP HILL, Pa. — It’s been an impressive journey for Rite Aid Corp.
Not long ago, Rite Aid was a struggling drug chain, laden with debt and unable to keep pace with larger, fast-growing competitors. But today, under a firmer financial footing, the $26.5 billion company stands as a profitable, innovative industry leader, widening its focus to the realm of retail health care. That effort is slated to become part of a bigger enterprise. With Walgreens Boots Alliance Inc.’s $17.2 billion deal to buy Rite Aid, the best ideas of both companies will help further WBA’s mission to be the global leader in pharmacy-led health, wellness and beauty retailing. The root of Rite Aid’s resurgence goes back to the latter part of 2008, when current chairman and chief executive officer John Standley, current president and CEO of stores Ken Martindale, and former chief financial and administrative officer Frank Vitrano joined the company and began an earnest assessment of the business. The next two years were spent taking steps to bolster liquidity and pare costs, as well as brainstorming to find ways to spur weak sales and declining script count and invest in the store base to position the company for growth. That led to the launch of the wellness+ rewards program in April 2010 and the debut of the Wellness Store format in early 2011, both of which marked a watershed for the company. Wellness+ takes a pharmacy-centric approach, giving members more points for prescriptions (including immunizations) and providing health-focused rewards. The program was billed by Rite Aid as an industry first. Meanwhile, the Wellness Store laid the foundation for a reenergized pharmacy and front end. The format offers expanded vaccinations, more clinical services, more wellness-oriented products, an improved store design and creative merchandising. The concept also ushered in the Wellness Ambassador, a special customer-service associate who serves as a bridge between the front end and pharmacy. The strategy clicked. Rite Aid reported its first quarterly earnings in more than five years for its fiscal 2013 third quarter — surprising Wall Street — and turned in another profit in the fourth quarter. The strong second half lifted the company into the black for the full year, its first annual profit since fiscal 2007. 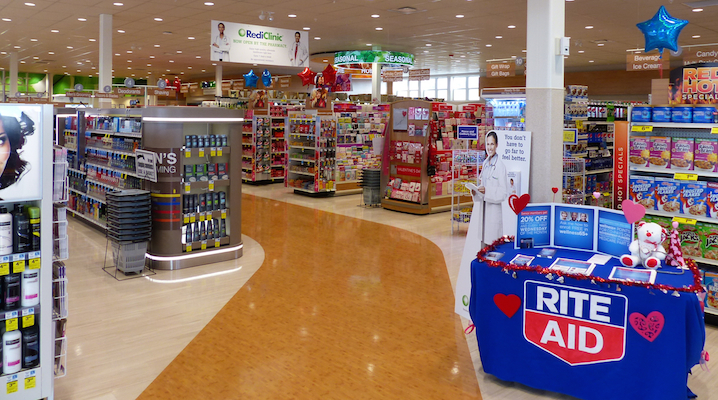 Rite Aid has since continued its sales and earnings momentum amid the growth of wellness+, now with about 25 million active members, and the Wellness Store, which now accounts for over 40% of the chain’s 4,561 stores. The company, too, has turned onto new avenues. In April 2014, it acquired retail health clinic operator RediClinic and health coaching and analytics firm Health Dialog. The latter anchors the Rite Aid Health Alliance program, in which pharmacists, health coaches and doctors work as a care team for patients with chronic ­conditions. Then in February 2015, Rite Aid announced the purchase of pharmacy benefit manager EnvisionRx. “With the addition of EnvisionRx, we will create a compelling pharmacy offering across retail, specialty and mail order channels, enabling us to deliver cost-effective solutions to employers and health plans while driving growth,” Standley said at the time. The $2 billion deal closed in June. Also this year, Rite Aid became the exclusive drug store partner in the new Plenti coalition loyalty program and launched an expanded rewards offering, wellness+ with Plenti. And as of its fiscal 2016 second quarter, Rite Aid began reporting revenue in two segments: retail pharmacy and pharmacy services, the latter being EnvisionRx. “The second quarter was pivotal for Rite Aid as we completed the acquisition of EnvisionRx and worked as a team to accelerate our transformation into a retail health care company,” Standley commented.